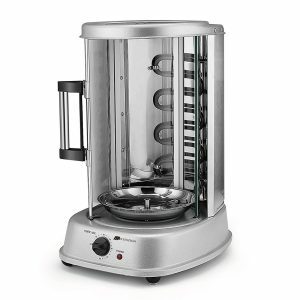 Silver Flexzion Tower Rotisserie is a countertop style vertical rotating electric oven and grill with a high performance 1500 watt power motor (120V and 60Hz) and 21 liters total capacity for making things like shawarma and kebab. It is a 5-in-1 electric cooker that is suitable for both home and commercial use. It is actually quite a versatile unit that gives you options by letting you make Middle Eastern kebab, shawarma, Brazilian rotisserie duck and chicken, grilled fish and vegetables that you can put on its stainless kebab skewers. It comes with a variety of accessories including the kebab rotisserie spit, seven kebab skewers, and rack, two rotisserie forks, two fish racks, two food trays, and a drip tray. It has a very simple to manage control panel with just a timer dial and a power indicator light and is quite easy to operate. With a high-performance motor of 1500 watts of power and a large 21-liter capacity, it delivers great performance and helps you prepare delicious meals saving you time and effort. You’ll find an easy to follow recipe book with clear step by step instructions in the box if you’re new to this type of cooking. Flexzion Vertical Rotisserie is a fairly portable cooker that weighs 12.58 pounds and is 16.5 inches tall, the base measures 11 x 13 inches and the round section is 9 x 6 inches. It is easy to clean as you can wipe clean the exterior with a damp cloth and soap and the grease drip tray will contain all the grease from the rack and skewers. As an ETL certified electric cooker, it meets a variety of safety standards and is very safe to use, with useful security features like an alarm timer, indicator light, and auto shut-off when the door is open. It will actually not work until the door is shut completely. The tempered glass door is resistant to high power heat of the rotisserie. You’ll see the simple instructions in the box on how to cook different types of ingredients. It works quickly and efficiently and helps make healthier meals by letting the fat drip onto the tray while maintaining the moisture on the meat. For those that are curious about cooking a whole turkey in this one, we doubt that a large turkey would fit in this unit and you’re better off cooking fattier things than turkey in this anyway. But overall it does a great job, looks good, is easy to clean and should prove durable.